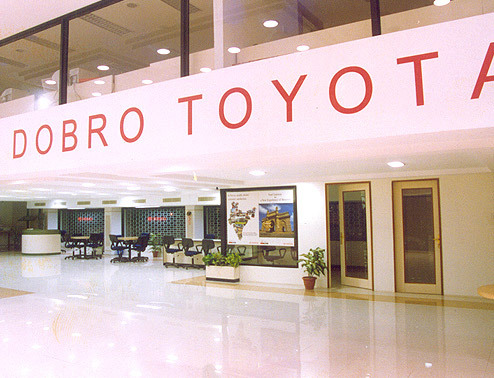 Planning for the Toyota Automobile Company which manufactures Cars like Qualis, Carolla, Innova & Camry started in 1997. The first cars rolled out in 2001 after a year of testing. Sited in Bidadi, a forest area 40 km from Bangalore, this project occupies 550 acres. About 110 acres have been developed in the first phase. These include Paint shop, Assembly Shop, Weld Shop, Parts Centre, Press Shop, Central Parts Depot, Office, Canteen, Locker, Utility Buildings, Water and Effluent are bother treated before use. The treated water from the effluent plant has been used to create ponds where fishing is actively pursued at this site. In addition to the manufacturing components other support amenities like a Training Centre, Dormitory Buildings for 250 people have been designed and built. A Technical Training Institute for 150 people ensures that young people who join the organization meet the exacting standards. Sports facilities for their staff are part of the master plan. A World Class Test track facility of 5 km is part of this facility. Other special features include a Press shop – 1200 Tons and 800 Tons Press pit and a Paint Shop and weld shop which are highly automated with Robot painting and welding.